Espresso and a cornetto con crema. 27 May 2012. Our newest Roman tradition, a yummy pastry after a week of walking and walking and walking. Today we indulged at Parco della Musica, not only a concert venue, but site of a fine “Zero Chilometri” farmer’s market where we acquired direct-from the producer honey, wine, bread, and herbs. 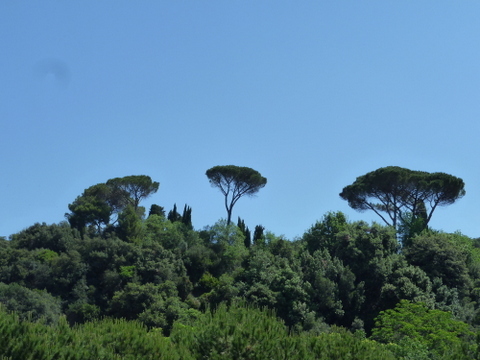 The Roman pines overlook the Parco della Musica. Portlanders: Pink Martini is scheduled to perform here in July! Happy Memorial Day to all! Yes, we get it off. We get the Italian holidays off, too. Life is good. Laurel, I love your posts. I am living it with you but please don’t take pictures of the food that was so painful. Love to see some of what you pass on your walk to work. I see that you have your wine already. Sooooo jealous!!! Laurel, We miss you so much. Sounds like life is good for you both and adjusting well. Keep in touch. Mary your feet and hands girl…. Thanks Mary! I miss you guys, too! But we will enjoy this adventure to the fullest! Love, love, love this! I’m there with you! Thank you for sharing your la dolce vita!!! Ciao, cara! Thanks for the note. The rainy days life is just little like Portland, but hey, we’re in Rome!